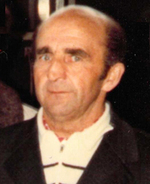 Born 28.03.1924 in Steindörfel. Attended school in Hochkirch from 1930-1938. His father died in 1934 when Ernst was ten years old. In April 1938 he started an apprenticeship as a shoemaker until completion in 1941. Worked as a journeyman in Bautzen-Holzmart until the end of 1942. Following this he was conscripted and sent to Italy. After one year of training he went into action in Russia. At the front he fell into captivity. Because of his knowledge of Wendish, he learnt Russian very quickly there, and had to interpret from time to time. In Moscow and vicinity he participated in the laying of water pipes. 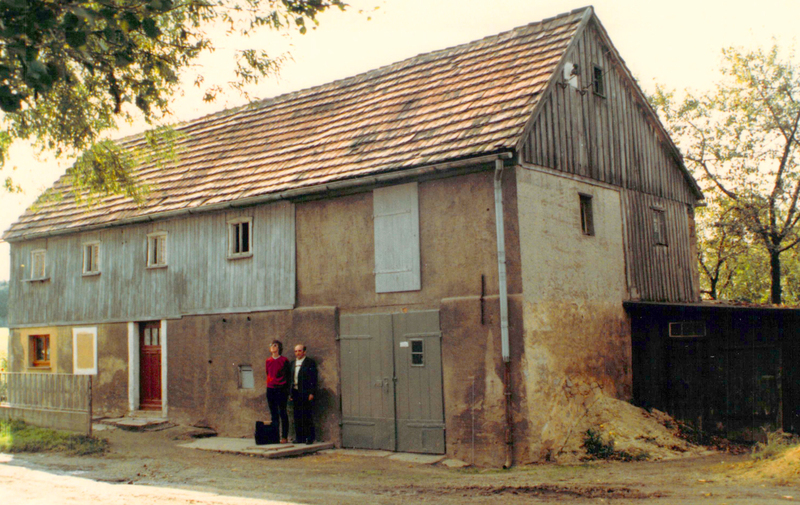 Del Zwar and Ernst Zwahr standing in front of the old Zwahr family home in Steindörfel, where Ernst grew up. In November he was discharged from Russian captivity and arrived home on 30.11.1950. From January 1951 he once again found work as a shoemaker-journeyman in Gerberstrasse in Bautzen. This is also where we got to know each other. In June 1952 he began work as a tracklayer for the Deutsche Reichsbahn [German Railway]. Appointed by the track-laying works in Magdeburg, he was engaged in the construction and also in part, the rejuvenation, of the tracks of what was then the DDR. Because of this work he was often away and seldom at home. We married on 27.09.1952 in Göda. Our daughter Anita was born on 16.06.1953, and our daughter Petra was born on 21.06.1957. In 1968 Ernst had to undergo a stomach operation and as a result of this he was transferred to the Internal Service in Hohenbocka in 1972. There he was engaged as a stoker, but also helped in mechanical works. In 1978 he was operated for kidney stones and after that always suffered. 3 May 1986, while working as a stoker, he had a stroke and was admitted to hospital in Senftenberg. He was paralysed on the left side, but after about a quarter of a year, this settled again. From this time, after the conclusion of all medical examinations, he was an invalid pensioner. During the years 1986 to 1990 he was always sickly and from time to time in hospital in Bautzen and Berlin. On 14.10.1990 he had severe pain in the limbs and we had to consult the doctor. The doctor diagnosed a heart infection and a new stroke, and straight away admitted him to the hospital in Bautzen. During the night of the 22–23.10.90, a blood clot became loose (on account of his thromobosis). In the morning hours of 23.10.1990 he died in the hospital in Bautzen.